Grape Nuts Peanut Butter Bars are perfect for days when you’re craving something sweet, but it’s too warm to bake. They’re like eating a peanut butter candy bar with a little fiber added. Line a 9×5 inch loaf pan with non-stick foil (or use regular foil and spray it with cooking spray. In a medium sized microwave-safe bowl, mix together the peanut butter, corn syrup and granulated sugar. Microwave for two minutes, stopping to stir after one minute. Stir in the cereal, then dump it all into your lined pan and press to make a bar. Let it cool, then slice into 8 squares. glad Louise posted that grapenut custard recipe. in my teens, i used to work at a mom-&-pop restaurant that had grapenut custard as a dessert and my entire shift would consist of restraining the urge to go and sneak spoonfuls. I made these last night. I used Jif peanut butter and would therefor decrease the sugar in the original recipe next time. I really wanted to put mini chocolate chips in, but I knew that would be a problem because the mixture was so hot while being mixed. Instead I put a layer of the Grape Nuts mixture into the pan, spread a handful of mini chocolate chips, and then put another layer of the Grape Nuts mixture on top. This also keeps the chocolate hidden inside so it doesn’t melt on your fingers when you eat them. 🙂 Thanks for the recipe. We thought they were simple, quick, and tasty! These are brilliant! Great use of this cereal….can’t wait to try them! I haven’t had Grape Nuts in ages! I use to sprinkle it on my yogurt for some crunch. These bars look so easy and good! How easy are those!!?? I love no bake recipes and I love 4 ingredient ones even better, I have to try these. I like GrapeNuts but only after they soak in milk for 10 minutes or so. Other cereals – Wheaties, Rice Krispies, are fine immediately. How about a survey? Do you like your cereal crunchy or soft? I’m relieved to hear I’m not the only one feeling the heat. Katrina, your Cosmic Brownies look great! I may try them today. Gina, I know what you mean about adding the chocolate chips. For some reason, I didn’t feel compelled to add them to this recipe. Gloria, they soften up a bit in these bars, but they’re still pretty chewy. Dawn, wow! Life changing weather? Cool. Mackenzie, cheesecake is one of those things that sounds so great in this weather, but just not practical to bake. Christine, let me know how your Raisin Bran experiment works out. Jess, CW Post thought they gave off a grape-y aroma, but I wouldn’t describe them as grape-y tasting. They have a malt and barley flavor. Sarah and Louise, thanks for the new ideas. Louise, I think I could turn on the oven long enough to try that custard. Oooh, I love grape nuts! My favorite comfort food in the winter is a bowl of grape nuts and milk, heated in the microwave till it softens to a porridge-like consistency, and sprinkled with cinnamon sugar. Mmmmmm so good! Jess, it’s cereal of crunchy little balls of wheat and barley made by Post. I’m sure there’s an Australian equivalent, but I don’t know what it is! CW Post named it Grape Nuts because he thought it smelled like grapes as it cooked. 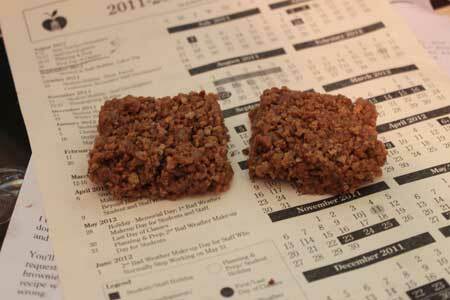 I’d forgotten that no-bake bars and cookies existed. In this Florida heat I think I’ll start turning to them often. I don’t have any grape nuts in the house but I might just try this with some Raisin Bran tonight! Darn, no corn syrup either. Raisin Bran and honey it is! It’s way too hot here to turn on my oven and I’m glad to see another no-bake recipe that is not cheesecake or oatmeal cookies. Hmm. Really? Very interesting. Not hot here, finally we are getting nice weather for a change: no snow, no rain and no humidity–it’s lifechanging. I need to get back int he kitchen and bake, it’s been a few days now. I used to love grape nuts, but they are too crunchy for my teeth now. I’ll bet they soften up nice in this bar though! Yum – these sound good. They already have a decent amount of sugar in them, but I still think they’re screaming for a handful (or two) of mini chocolate chips. 🙂 You can’t go wrong with peanut butter and chocolate. I’ll be trying these. Thanks for the recipe & review. It’s finally springing here–perfectly gorgeous today, about 65 degrees. I’m not missing that Midwest heat I know is happening. Sorry it’s been too hot to even bake. No bake treats are definitely the best for that heat! I love Grape Nuts.